SNMMI is pleased to announce that it has once again reserved discounted room blocks through SPARGO, Inc., SNMMI's official housing company, at six popular area hotels. Attendees are welcome to stay at the hotel of their choice. Please be aware of unauthorized housing providers. SNMMI is excited to continue its roommate sharing program designed to assist those with limited travel budgets. Register yourself as a roommate or view those signed up looking for roommates. Please note that, due to the close proximity of all hotels to the Anaheim Convention Center (1 block or less), SNMMI will not be offering hotel shuttles at the 2019 Annual Meeting in Anaheim. Our fantastic location across the street from Anaheim Convention Center and just one mile from Disneyland® Resort, makes us the perfect choice when visiting sunny Orange County. Located in the heart of Orange County, Hilton Anaheim is close to world-class shopping, dining and entertainment. Our rooms and suites provide a comfortable base to recharge after a busy day. Experience the magic of Disneyland® Resort from a special Disney® View room, providing great views of the fireworks display and the resort. Sun-seekers will love deck-access rooms, and spacious suites offer families and executives double the living space. The Anaheim Hotel is a three-diamond hotel located across the street from the exciting Disneyland® Resort and near the Anaheim Convention Center. On nine acres of landscaped gardens, The Anaheim Hotel offers 306 rooms, an Olympic-sized pool and Jacuzzi, 6,800 square feet of flexible meeting space with banquet capabilities, on-site restaurant The Pizza Press, and lobby bar. The Anaheim Hotel is dedicated to providing superior service in a welcoming environment with a variety of amenities for your convenience and enjoyment. It’s more than just location; it's a great value. Whether you are visiting Anaheim Marriott for work or play, you’ll love our convenient location in the heart of Anaheim’s Resort District. Steps from the Anaheim Convention Center and walking distance to Disneyland®, our upscale hotel is a short distance to the excitement of Angel Stadium and concerts at the House of Blues. We offer Southern California living at its finest, consistently ranking among the best hotels in the city for our service and luxury accommodations. Rooms feature plush bedding, marble bathrooms and balconies, many with views of Disney fireworks. We offer a cutting-edge gym, resort-like outdoor pool and rejuvenating whirlpool. In the heart of the Anaheim Resort District lies the brand-new Hyatt House at Anaheim Resort / Convention Center, a unique hotel offering, contemporary décor, inviting social spaces and generous amenities. Our hotel is perfect for families on vacation and those traveling for business, as we offer spacious rooms and suites with separate living and sleeping areas, full kitchens and even bunkbeds (where applicable). 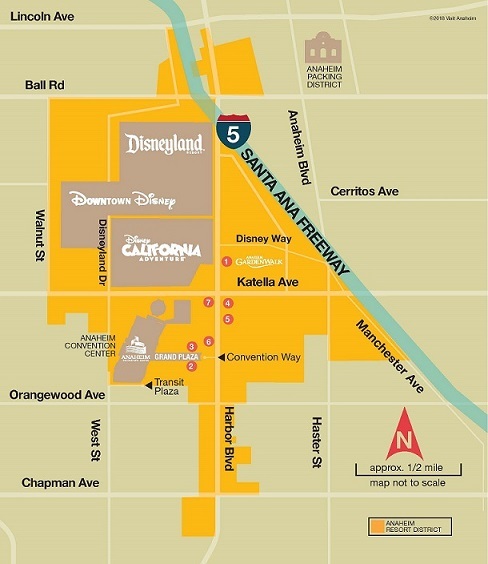 We’re less than a mile away from Disneyland® Resort parks and Anaheim Convention Center, while attractions like Knott’s Berry Farm, Angel Stadium and Honda Center are just a short drive away. Our resort-style hotel in Anaheim features all of the hotel amenities travelers expect, plus additional conveniences to make your stay the best ever. Offering free Wi-Fi in our 308 modern guest rooms and public space, onsite dining in our family friendly restaurant, a beautiful outdoor pool with fire pits, easy access hotel parking, and flexible meeting space. We aim to make every experience memorable when traveling to Anaheim, CA. Ideally located within walking distance to the Disneyland® Resort and the Anaheim Convention Center, you’ll enjoy being in the heart of the magic...Our 486 guest rooms and suites feature the Sheraton Signature Sleep Experience, as well as private balconies with views of either the lushly landscaped patio and pool area, or the DISNEYLAND® Resort and GardenWalk. All of our guest rooms are non-smoking and feature an array of upgraded amenities such as granite vanities, SHINE by bliss toiletries, complimentary mini refrigerators and complimentary in room safes. The Brand New Springhill Suites Anaheim Resort/Convention Center raises the bar for hotels near Disneyland offering a new level of style, comfort & convenience. Nearly no other hotel combines the close proximity to Disneyland and the Anaheim Convention Center with modern & spacious suites & Free Breakfast, like the Springhill Suites by Marriott Anaheim. Enjoy homelike comforts including a mini-refrigerator, microwave & coffeemaker, as well as a spacious seating area with pullout sofa, ergonomic work desk and chair, and separate bedroom. Spend a night, a weekend, or an extended stay in our all-new designer suites or our family-friendly kids suites. NEED TO MAKE A CHANGE/QUESTIONS? For housing related questions, call 866.849.9828 within the U.S. and 703.449.6418 (International) outside of the U.S. The hotel will charge a cancellation fee equivalent to one night's stay plus tax to the credit card on file if reservations are not cancelled at least 72 hours prior to the confirmed check-in date. Please review your check-in and check-out dates carefully. The hotel will not automatically reinstate the reservation if you do not show on your confirmed check-in date. Please Note: Canceling your hotel reservation does not cancel your meeting registration. If you need to make changes to or cancel your hotel reservation, please do so prior to May 28, 2019, at www.snmmi.org/am. If you prefer, you may send your changes or cancellation via email to snmmihousing@spargoinc.com. All changes are subject to hotel availability. If you do not receive a confirmation of requested changes within 3 business days, please contact the SNMMI Housing Center. After June 3, 2019, you must contact the hotel directly for changes (subject to hotel availability) and cancellations. Please do not call the hotels between May 28-June 3, 2019 as hotels most likely will not have your reservation in their system during that time.